Hilton Head Magazines: CH2/CB2: The Smile Factor: Cosmetic Dentistry Helps You Smile With Intensity! According to Wikipedia, “a smile is a facial expression formed by flexing those muscles most notably near both ends of the mouth and is customarily an expression denoting pleasure, happiness or amusement.” Okay, we all know that. But what does it mean to smile? A genuine bright smile can put someone at ease, make them feel welcome and accepted, and best of all, may elicit smiles in return. Mother Teresa said, “Every time you smile at someone, it is an action of love, a gift to that person, a beautiful thing.” Most of us agree we are drawn to smiling people and enjoy being around them. As a cosmetic dentist, I meet many people who avoid the big bright smile because they are self-conscious about the appearance of their teeth. Teeth that are crowded, spaced, dark in color, have aged fillings, are chipped, broken or just plain missing are all reasons why some people avoid smiling. The societal stereotype of teeth is evident wherever you look. Throughout history, cartoons, caricatures and characters in movies and television reveal this. The appearance of teeth is often used to indicate intelligence, health, socioeconomic status and even personality. A simpleton may have spaced or crooked teeth and rarely do you see an evil villain or homeless person portrayed with a bright beautiful smile. But the hero will have an attractive smile and so will the princess. These cultural stereotypes certainly can make some individuals self-conscious, and as a result, hold back the smile they may feel inside. There are professional organizations in dentistry, such as the American Academy of Cosmetic Dentistry (AACD) whose focus is to enhance the knowledge and skill of dentists to be able to correct these cosmetic concerns. “Give Back a Smile” is the AACD’s charitable foundation. The Foundation’s mission is to help individuals who have suffered dental trauma as a result of domestic violence. The Foundation pairs up the individual with a volunteer cosmetic dentist and a lab technician who provide the cosmetic dentistry free of charge. The new smile can restore self esteem and the confidence they need to start a new chapter in life. 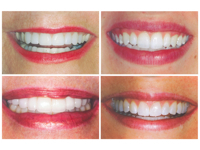 One young lady who works in the dental field had aged and stained fillings on her two front teeth. She felt she could not smile fully at her patients because she didn’t want to show these teeth. A simple, one-visit appointment changed that. Now she smiles fully all day and feels great about herself. A scientific study was done by Earnest L. Abel and Michael L. Kruger from the Mott Center for Human Growth and Development at Wayne State University. It was titled “Smile Intensity in Photographs Predicts Longevity” (February 2010). This was the first study to link smile intensity to a biological outcome: longevity. The study focused on Major League Baseball players because there are statistics available and they represent a homogenous occupational group. Two hundred thirty photographs were taken from the Baseball Register for 1952, and the analysis was restricted to players who debuted prior to 1950. The photographs were rated on a scale of smile intensity. Although the study goes into great detail on methods used to determine smile intensity, the results were simple and significant. Players with no smiles lived to an average of 72.9 years of age whereas players with the highest intensity of smiles lived to an average of 79.9 years of age. Players with partial smiles fell somewhere in between. I suspect there may be other factors that influenced the outcome of this study. The easiest way to smile is to think happy thoughts. And there is much research linking happiness and optimism to quality of life and longevity. My point is, if you have the desire to smile big but hold back due to the appearance of your teeth, find a cosmetic dentist. We have the ability and technology to offer solutions to help you smile with intensity. Not only will the world smile with you, you might just live longer!